There is more to reading than taking in the words on a given page. Reading is about connecting those words to the real world to give them meaning. 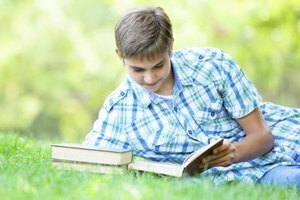 The fundamental framework of reading comprehension lies in the reader's ability to derive value from the material, not in the number of words read per minute. To improve your reading comprehension skills, follow the steps below. Skim the material. Read the table of contents to get a basic idea of what information the book includes. Then run through the pages, taking in titles, subtitles, headings, appendixes, glossary, pictures, graphs and any words in bold type. Let your eyes move rapidly over the text, rather than trying to read every word. Don't try to remember anything specific; just try to get a general feel for the information. Decide what the material is about and what you hope to achieve by reading it. Ask yourself what you want from the material. By focusing on your personal goals, you allow your mind to concentrate on locating the information that would be most useful to you. This can help to generate personal motivation and increase your level of interest. Generate questions about the material. Now that you have a general goal in mind, write down a few specific questions pertaining to your goal. Try to anticipate how the author will present the information. When you spot relevant vocabulary in the text, you will automatically connect it to your question. Take notes while reading and underscore significant or meaningful passages. One of the best ways to remember something is to write it down. 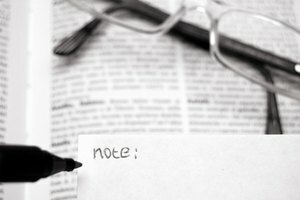 When you come across an important point, or something you wish to remember, jot a note on a separate piece of paper, make a note in the margin or underline the passage so you can find it again. Review what you have read to be sure you understand the material. Did it answer the questions you asked? If not, go through the material once more to determine why. It is possible the answers you were looking for just aren't there, but by reviewing the material it becomes easier to recall and you can establish what you have learned, as well as what you haven't. Summarize the material. Write out a short version of what you have just read, highlighting the main points, opinions, and conclusions. This will help reinforce general comprehension of the information. If you come across a word you don't know, look it up. Read a variety of materials: books, newspapers, magazines and more. It will help you to adjust to different styles of writing and contribute to your general overall knowledge. If you're pressed for time or have a large quantity of material to get through, read the first sentence of each paragraph. The first sentence provides the main idea; the sentences that follow it give supporting information. Try to discuss the material with others, expressing opinions and ideas pertaining to the text. Parris, Lisa. 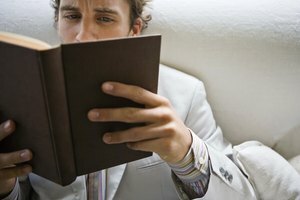 "How to Improve Adult Reading Comprehension." Synonym, https://classroom.synonym.com/improve-adult-reading-comprehension-4881672.html. Accessed 23 April 2019.